This is a relatively new, all-solid-state Harris transmitter, which replaced WBZ-TV's old main transmitter in the same location. To avoid having to shut down the old transmitter, the new transmitter was assembled some feet in front of the old transmitter, and then pushed back into the old unit's space after it was removed. 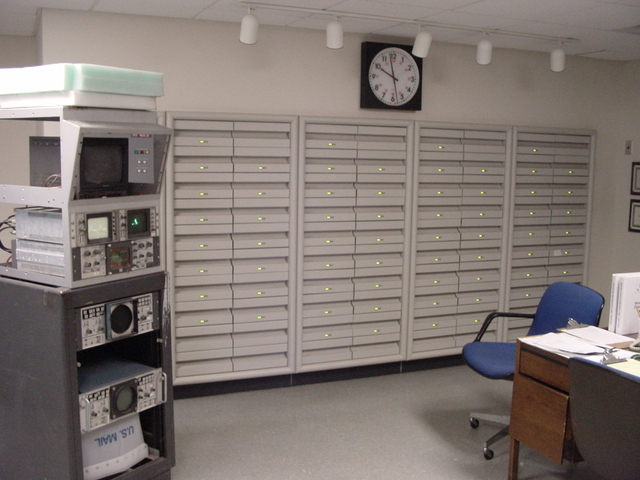 The transmitter's control panel is hidden behind a cart of test equipment. Copyright 2004, Garrett Wollman. All rights reserved. Photograph taken 2004-05-05.